THINGS’ Wall of Fame is an annual award presented in recognition of an exceptional individual who has built a successful business empire based on pioneering innovative technology that has come to define the world we live in. Thereby acting as an inspirational role model for the startup community in Sweden. 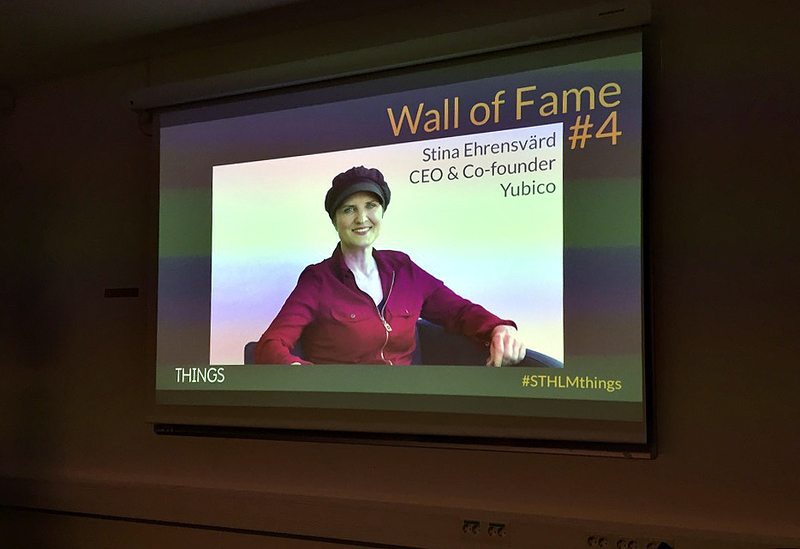 Yubico’s representative Annie Fornelius received the award on behalf of Stina at THINGS’ 3-year anniversary event which took place on 22nd March 2018 with 300+ tech startup and industry guests. Stina joined us in spirit with a video message from her Silicon Valley offices, outlining Yubico’s entrepreneurial journey and revealed that the most rewarding aspect of building a successful business comes down to great teamwork. Stina recounted also, how Yubico distilled their vision of making the internet safer for everyone in a half page business plan and targeted only a handful of the really big internet companies on America’s west coast. Success and verification with Google in 2012 meant other services soon followed and they were able to scale their technology to millions of users. Nicolas Hassbjer founded HMS in 1988 as a result of a student project at Halmstad Högskola, with a passion for electronics and embedded software, HMS was an early pioneer of Internet of Things and is today a world leader in industrial communication. HMS have over the years achieved rapid annual growth and closed 2016 with close to 1 Billion SEK in revenue and almost 500 employees. With professional management, continuous innovation and a successful IPO, HMS have developed into a success story within the Internet of things area. Axis was the first company in the world to launch a network camera in 1996, initiating the shift from analog to digital technology. Today Axis is the global market leader in network video, driving the industry by continually launching innovative network products based on an open platform - delivering high value to customers through a global partner network. Solid management, continuous innovation and a world-class indirect sales organisation has made this company started by students in Lund a true success story. Stina Ehrensvärd, founder of Yubico accepts THINGS' 2018 Wall of Fame award via a video message from her Silicon Valley offices. Pär Hedberg, THINGS' chairman of the board presenting the award.